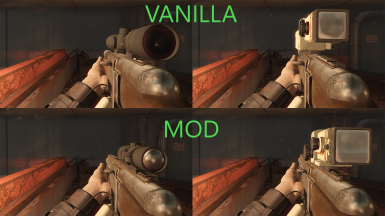 Replaces vanilla Combat Rifle weapon mods to get endless options from submachine guns to sniper rifles. Adds new stuff as well. Ask for permission before using this mods assets. 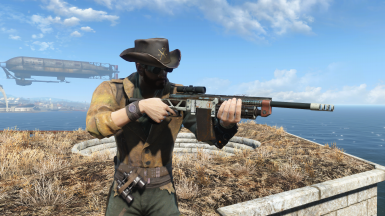 Ever wondered the niche vanilla weapon combat rifle felt a little bit off? Recycled from the combat shotgun, using hunting rifles barrels and magazines. And using .45, a pistol cartridge? Well here's the solution. A late, but a satisfactory solution at least. What this mod doesn't do? - Doesn't add a new weapon. 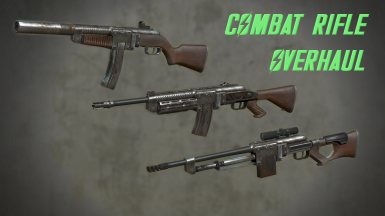 You don't need to find or buy these new weapons, they are all the same one and only combat rifle. - Doesn't require a new playthrough. Even if you have thousands of combat rifles they won't appear broken. Most won't have buttstocks though. - Shouldn't conflict with any mod that wouldn't replace or add combat rifle weapon models and mod models, or change its in-game stats. 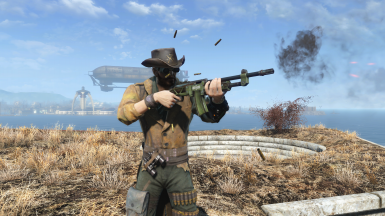 - Shouldn't conflict with any texture mod for combat rifle. 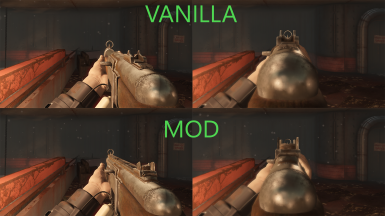 All textures are vanilla. Although there may appear some bad texturing if a texture mod is used, I can't guarantee. - Replaces combat rifle weapon mods with many more diverse and unique options. No more recycled models. - Adds 3 major reciever types. Light rifle using 5.56mm is now default size. 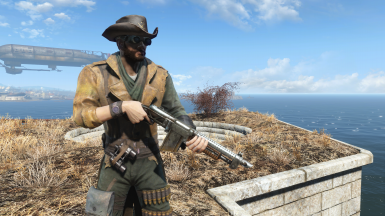 There is also 4 SMG size receivers using .45 and 4 battle rifle size receivers using .308, both are replacing existing receivers so you probably have them already. - Every size of recievers come with 3 sizes of magazines, small, medium and large. 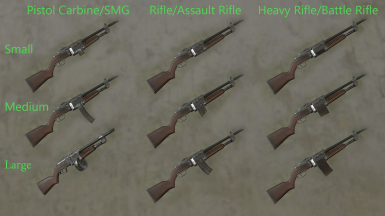 Changing the reciever type automatically changes the magazine size to small, and you have to craft larger magazines. - Or you can find/buy an SMG or a battle rifle variant with larger magazine. The leveled list work for these. - The grip mod category is now divided to two: Grip and Stock. The standart wooden stock is the only one in grip category without stock option. Other grips open up the stock option, which are completely new and either have to be crafted or found in the wild or bought. - Adds another option of caliber conversion, standart 5.56mm receiver can be converted to 5mm, and .45 can be converted to .38 or 10mm. 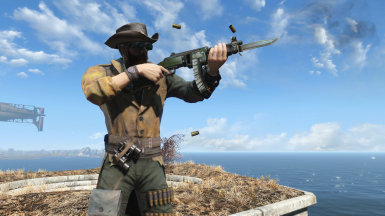 - Let's you still use the faction materials from Creation Club. - Default ammo is now 5.56mm instead of .45. - Large magazine has now 35 rounds instead of 40. Lite version should be compatible with most of the other mods. - Default caliber is 5.56mm. Alternative caliber receivers consist of 2 semi-auto and 2 automatic for both, they replace some vanilla receivers. For example .308 receiver remains as it is, while heavy receiver also becomes a .308 receiver. Rapid automatic receiver and hair trigger receivers become .45 receivers etc. All receivers are thinner than vanilla. 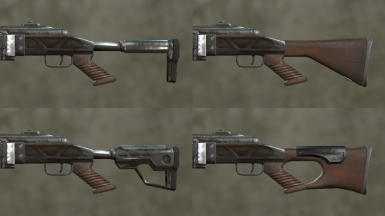 Combat shotgun receiver remains almost same. -Again statwise same, but has unique models for muzzle brake and compensator. Bayonet is changed to hunting rifle bayonet with no handle. - Each caliber has 3 sizes of magazines, with a total of 9 different magazine sizes. Because default caliber becomes 5.56mm, the default magazines also becomes 5.56mm. It uses a new models. 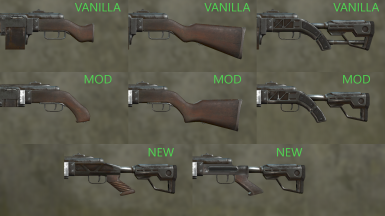 The old models are used for .308 receiver but as item these are new. Also .45 magazines are new as item and model. - Stocks are a new category, and just like the grips, stocks are interchangable between combat rifle and combat shotgun. - Scopes are not interchangable between combat shotgun and combat rifle. There are just too many scopes already so I left it as it is. Statwise they are same. New models for iron sights, scope and used the pistol recon scope instead of rifle, because the latter is ridiculously huge. 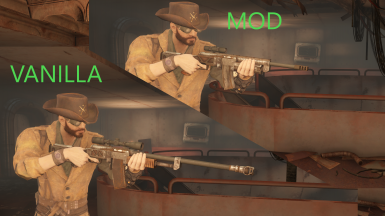 Important Note: If some mod categories don't appear in weapon bench, try exiting the bench and equiping the gun, after that they all appear.